All of our lunches come from Gates-Chili School District Food Service. Each day the students will have a choice of 4 main dishes: a hot menu item, a salad with a protein item, a cold sandwich or a peanut butter/jelly sandwich. All sandwiches and the small roll that goes with the salad, will be whole wheat. Each lunch will include either fresh fruit or canned fruit. The canned fruit will be low sodium and low sugar. Each lunch will also include a choice of vegetable. Students will have 3 choices of milk: 1% white, or fat free chocolate, or fat free white. ABSOLUTELY NO DRINKS OTHER THAN MILK OR WATER WILL BE ALLOWED. The cost for these lunches will be $3.10. 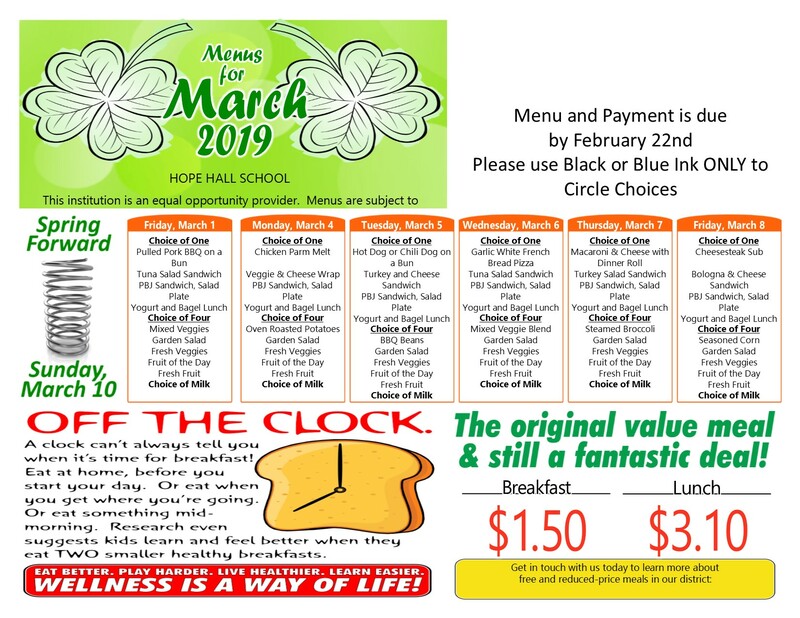 Lunch orders are sent home on the second or third Monday of the month. They must be returned the Thursday of that same week. Orders MUST be placed monthly. Lunches are $3.10 each. Payment may be made with cash, money order or check for the exact amount and must be submitted with the menu. Checks should be made payable to Hope Hall. There is a fee of $25 on all returned checks. 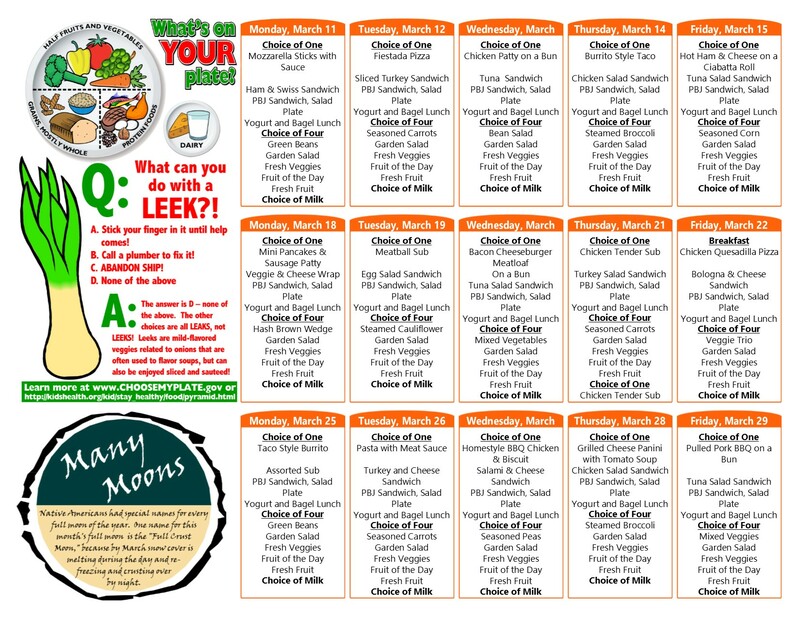 Each lunch selection MUST be circled in pen only – NO PENCIL, NO HIGHLIGHTER – one entrée item and up to 3 sides may be selected (1 fruit, 1 vegetable must be selected). If a child forgets his/her lunch, a lunch may be available for $3.10. A slip will be sent home requesting payment the next day. Extra lunches are sold on first come, first served basis at the regular price of $3.10. Lunches include choice of low-fat chocolate or white milk and fruit. If your child can’t drink milk, we can provide water or you can provide a juice drink that is 100% juice. PLEASE, do not send pre-purchased cans or bottles of soda, or carbonated drinks, or drinks that are high in sugar or caffeine. This is in keeping with codes established by the New York State Health Department. Our emphasis is on helping each student to view the cafeteria as our DINING ROOM and to use behavior that is expected as if they were in a nice restaurant. Please support us in this expectation by packing lunches that are healthy for your child, and reinforcing what YOU would expect behavior to be like if you were present. Students may bring their own lunches from home; however, microwaves are NOT available for student use. We ask that each family follow these rules and keep them posted in a convenient location for your reference. If you have any questions about lunch orders, please contact our Cafeteria Coordinator, Ms. Patti Battista, at (585) 426-0210 Ext. 113 or patti.battista@hopehall.org.